[vc_row][vc_column][vc_column_text]The Solar Eclipse happened on August 21, 2017. In Walla Walla we had about 96.9% total coverage. This image represents my vision on the event. 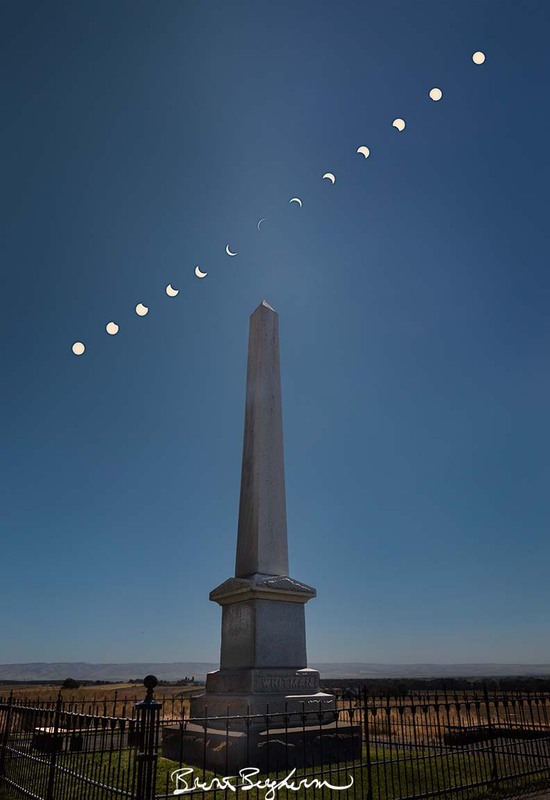 I crafted this scene in my head a few weeks before it happened and utilized an app to help gauge alignment so I could get the memorial obelisk pointing right towards the sun at maximum coverage. All prints are made to order and therefore can take some time to process. I custom print each piece myself using the finest papers by Canson Infinity. For this print I have chosen a semi-gloss or lustre print surface. It helps maintain richness of color while not being overly glaring or flashy. The paper is also archival in quality and will last for generations to come. Please don’t store fine art prints in direct sunlight. They will get damaged. I also hand sign all prints, the preview you see here is a digital watermark of my signature. When you purchase a print, I sign using either a gold or silver marker in the lower right corner. If you’d like it not to be signed please just let me know. I’ll sign it on the back instead. This print is an open edition. Prints requiring shipping are rolled and mailed in a tube. Photoshop has been used to composite this image, but I assure you, it is true to my original vision I set forth for this subject and this event.